A coronary artery is either of two arteries – the right coronary artery and the left coronary artery – that arise one from the right and one from the left side of the aorta immediately above the semilunar valves. 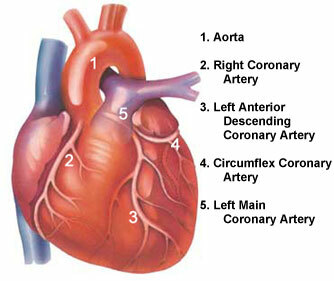 The coronary arteries wrap around the surface of the heart and supply the heart with essential oxygen and nutrients. They form no effective anastomoses (communicating openings) with other arteries, so that any blockage of a coronary artery is immediately life-threatening. The coronary arteries spring from dilations (narrowings) of the aorta called the sinuses of the aorta, of which there is one anterior and two posterior. The right coronary artery arises from the anterior sinus, and the left from the left posterior sinus. The right coronary artery passes forward between the pulmonary trunk and the auricle of the right atrium, and runs downward, in the atrio-ventricular groove, to the lower part of the right margin of the heart, round which it curves. It then proceeds to the left, in the posterior part of the atrio-ventricular groove, and ends by anastomosing with the left coronary artery. During its course, it gives branches to the walls of the right atrium and ventricle. The most constant of these are: (1) a slender marginal artery, which runs from right to left along the lower margin of the front of the heart; and (2) an interventricular branch, which runs forward on the diaphragmatic surface. The left coronary artery runs for a short distance toward the left behind the pulmonary trunk, and then forward to appear between the pulmonary trunk and the auricle of the left atrium; it next curves backward and downward in the left part of the atrio-ventricular groove to reach the lower border of the base of the heart; where it ends by anastomosing with the right coronary. Its branches supply the roots of the aorta and pulmonary trunk and the walls of the left atrium and ventricle. The left coronary artery typically runs for 1 to 25 mm before bifurcating into the anterior interventricular artery (also called left anterior descending (LAD) artery) and the left circumflex artery (LCX). Occasionally, an additional artery arises at the division of the left main artery, which is known as the intermediate artery.